Bugs don’t have meat on them, so Selkie probably isn’t missing much anyway. Heather better wipe that smug look off her face. There’s no need to be a you know what when someone hasn’t even done anything… and why doesn’t she like Sandy? She’s never done anything to anybody. Well, Sandy WAS responsible for getting Amanda caught “red handed” in a paint your roommate while sleeping incident. And the two are SO different personality wise and they had to live together, so being mistaken for sisters… yeah that would be weird. Also, oddly enough her last room mate DID end up getting transformed into her sister, so you can’t be too careful with Karma. Any anyway, Amanda has a professional obligation as the official “bad kid” to hate everyone. Probably a reflective reaction by now. I bet she’d like them if she tried them. You’re referring to the bugs, not toMandy hating everyone, right? I misread your comment as, “I bet she’d like them if she tired them.” And had to laugh cause kids get more cranky and irritable when tired. And a drumstick for everyone! There’s a tarantula in Venezuela that has actual meat inside, like a crab. All of them have that if you cook them right, it’s just that most are way too small, so it makes more sense to just eat them whole. I’m actually surprised Selkie’s never eaten bugs- they’re a good source of protein, and you’d think that a sentient carnivorous race (even aquatic) would take all the variety they could get in their diet- considering they can’t even handle spices. A lobster is basically just a giant underwater cockroach. Friend of mine from England mistook a stylized lobster design for stylized scorpion one. (I will never ever forget this, because it amuses me so much. ^_^ ) So they’re clearly water-scorps! Hilariously close to the truth; scorpions, lobsters, crabs, spiders, and a lot of other things are “arachnids.” Think, one more pair of legs than insects, and usually a special setot two of extra non-leg limbs (eg: spiders’ pedipalps). Uh, no. Lobsters and crabs are crustaceans. Specifically, decapods, so they actually have ten leg-derived limbs. The claws are homologous to legs rather than the pedipalp-claws of scorpions. If I remember correctly, the second pair of crustacean antennae are homologous to pedipalps, but I’m not sure, so DON’T quote me on the last part. No, but they could be second cousins, or second half-cousins, or something if Dave Warren is like Dave Willis. Then Mandy and Sandy would be related through Andi’s Father fathering Andi and then with his second girlfriend/wife someone who would be Andi’s half sister/brother. But Mr. Warren is not Mr. Willis, and we are all grateful. That would be too much Walkie-drama/ irony for any universe. But seriously – Ken never took part in the “go to the orphanage to look for a kid” part of the adoption? I remember Selkie and George discussing “that blonde woman that talked to Selkie for two minutes and then played with Heather for like an hour”. 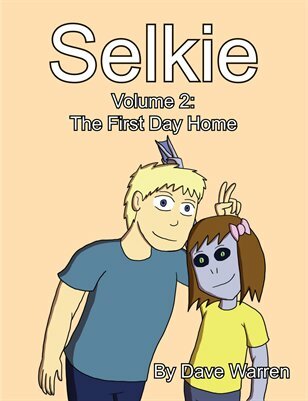 https://selkiecomic.com/comic/selkie26/ Barb make the “we’re adopting this little blonde girl” decision on her own? Ken never met any of the other kids? Um actually bugs are incredibly high in protien, Tarantulas are tasty, Cockroaches are edible there is a rather good supposedly Iranian soup made from cockroaches (the larger one are supposedly tasty Ive never been that hungry myself and will infact run screaming at top speed away from them and I WILL run you over trying to get away) Crickets fried are pretty good, Ants of course are tasty. So are Termites, BlowFly are eaten in Vietnam. Goliath beetles are supposedly good too, Never eaten em myself. Various Grubs/worms/ slugs/ creepy crawlies are eaten around the world by humans. I just don’t get why they have to look that way. I wouldn’t eat steak if it looked like a cow either, so why are they trying to serve crickets that actually look like crickets rather then, dunno, ground them up or something? Ha, I love it when people have a lot in common that they express in trying to hate each other. They’re little girl versions of Dr. Venture and the Monarch. As for bugs, whaaat you’re gonna tell me Selkie’s people don’t devour crayfish by the ton in their native lakes? I’m getting a pretty serious Gaston vibe from Kenneth. Once again I am reminded that if I was adopting from the cast, I would pick Sandy.